That’s where we come in, with these answers to 15 common questions about conversion optimization. By the end, you should be ready to run your optimization tests, and get more conversions, leads, and sales. 1. What does a conversion mean in marketing? In marketing, a conversion is an action taken by visitors, subscribers, or customers in response to your call to action. Businesses count a lot of different actions as conversions, but the term is likely to include anything that moves people a step closer to being customers. There are also even smaller micro-conversions, like following you on social media. Those actions are part of the conversion funnel (see question 2) and are also some of your conversion goals (see question 7). Note that conversions don’t always result in immediate sales. However, they start to build your relationship with subscribers, visitors, and customers so that you eventually make sales. 2. What is a conversion funnel? A conversion funnel is a way to visualize people’s connection with your business or brand from the time they become aware of you until the time they become customers. 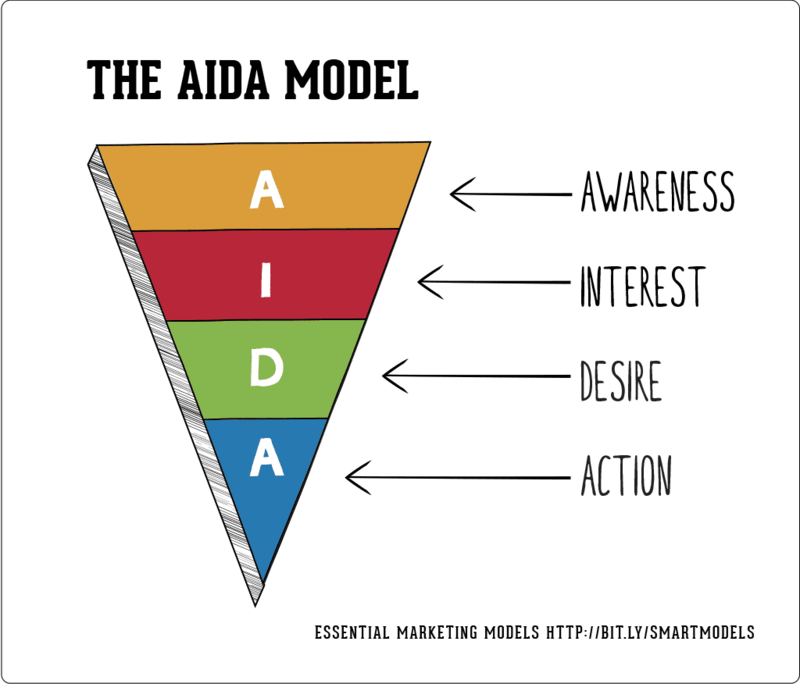 The most common funnel covers the four major stages of awareness, interest, desire, and action (AIDA). Awareness is when people start to become aware of your brand, and recognize that they have an issue to solve. Interest is when they start looking at ways to solve that issue, considering your brand as one possibility. Desire is when they’ve narrowed their choice and want to know more, actively considering buying from you. Action is when they take the final step, and purchase. At each stage of the funnel, you’ll have different expectations of your visitors, subscribers, or customers. These will be your conversion goals (see question 7). 3. What is conversion rate optimization? Conversion rate optimization (CRO), also called conversion optimization, is about increasing conversions from your existing web traffic. That means tweaking pages to boost the number of people who take action. You can also do CRO for email marketing, as detailed in our guide to email marketing conversions. As you’ll see in that guide, conversion optimization involves a lot of testing, measuring, and making incremental changes. 4. Why is conversion rate optimization important? Conversion rate optimization is important because it lets you capitalize on the visitors and traffic you’ve already got. That makes your marketing more effective, because instead of trying to reach people who may not even be interested, you’re focusing your efforts on the people who are already there, and who have shown some interest. That keeps your costs down, and improves return on investment (ROI) for your marketing. 5. How do you calculate your conversion rate? If you want to calculate your conversion rate, you’ll need two numbers. First, the number of visitors (or in the case of email marketing, subscribers). Second, the number of those who take action, or convert. Your conversion rate is expressed as a percentage. If you have 10,000 visitors, and 500 take action, your conversion rate is 500/10000, or 5 percent. 6. What is a good conversion rate? If only there was a clear answer! “What is a good conversion rate?” is one of those questions that’ll get you a different answer every time you ask it. Landing page experts Unbounce say the average conversion rate for a landing page across 10 different industries is 4.02 percent. But conversion rates vary widely by industry. In Unbounce’s research, higher education landing pages had an average landing page conversion rate of just 2.6 percent. In contrast, vocational studies and job training landing pages had a conversion rate of 6.1 percent. In other words, a good conversion rate isn’t something absurd, like 25 percent. It’s almost certainly in the single digits. But beyond that, it varies wildly from industry to industry. It also varies depending on what you’re looking at converting (e.g., an email, a landing page, a product page, etc.) and what goal you’re hoping to convert (e.g., a sale, an email signup, a free download, etc.). 7. What is a conversion goal? 8. How will analytics help with conversions? As mentioned earlier, measurement is an important aspect of improving conversions. That’s why before starting with conversion optimization, it’s important to know what your baseline is. Analytics is a key tool in helping you with this. You can use web traffic analytics tools like Google Analytics to track the behavior of visitors to your website. And you can use heatmap and click tracking tools like Crazy Egg to see which areas of a web page are most successful in getting visitors’ attention. When you have that information, you can start thinking about how to improve your key metrics. You can also set up goals and funnels in Google Analytics to match your customer funnels and important conversion goals. This makes it easy to see what’s working, and what’s not. As well as analytics, you can often get this information via customer feedback. Email platforms, like Jilt, often include detailed analytics about actions people take with regards to your email campaigns, such as open rates, click through rates, and attributable revenue. Once you have a good handle on the metrics around your individual pages and emails, you can start to think about reasons why particular pages or email campaigns aren’t converting well. This will help you form a hypothesis, which is a key part of conversion optimization. 9. What is a CRO hypothesis and how do I develop one? We think that changing [item on page] for [audience] will [achieve desired outcome]. We think that changing the text on the call to action button for web visitors will result in 100 new subscribers to our newsletter each month. A detailed hypothesis also includes how you’ll measure success. That means looking at the data collected before and after the change, as well as customer feedback, to see whether the situation has improved. For our example above, you could look back at average email subscriber numbers in the past and see how that has changed after running your conversion tests. 10. What testing methods can I use for conversion optimization? There are several conversion optimization testing methods you can use. One of the most common is A/B testing, also called split testing. In this process, your original web page (or email) is called the “control.” You change a single element to create a new version of the page or email, called the “variant.” Then you divide your traffic or audience so that half your traffic sees each version. At the end of your test (we’ll talk about testing duration a bit later), the version that gets the most conversions is the winner. You can also do A/B/n testing, where you have more than one variant, and split the traffic equally among them. 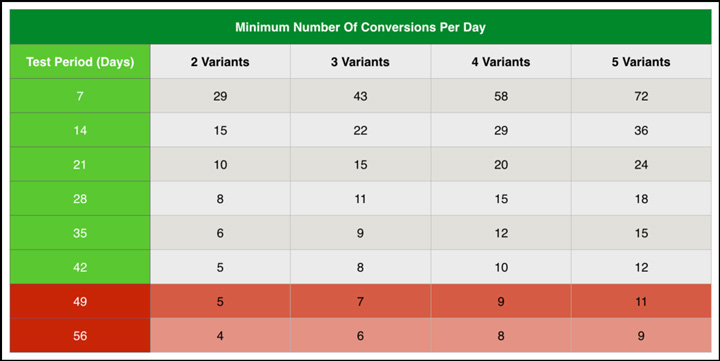 Most pro conversion optimizers recommend no more than 3 or 4 variants for any test. A third option is to change multiple options on the page at the same time. This is called multivariate testing. It’s trickier to measure, however, since you can’t be exactly sure which of the changes you made led to higher conversions. And then there’s usability testing, where you get real users to do tasks on your site, and see how well they are able to achieve them. With the exception of usability testing, these types of testing generally require a sizable audience to deliver statistically significant results. If you’re just starting out, it’s likely you don’t have the traffic or email list size to properly A/B test. In that case, it’s best to measure results toward your goal before and after a change, and also listen carefully to user feedback. 11. What are some conversion rate optimization best practices? There’s also the issue of testing the right pages or emails, which we’ll look at in the next question. So, what does it mean to set up your CRO test correctly? In most cases, it’s about testing like against like. For example, comparing traffic and conversions during Black Friday to traffic and conversions on an ordinary weekday isn’t testing like against like. Instead of doing that, make sure that when you test, you’re working with similar audiences, time periods, and conditions so you end up with reliable results. It’s important to test for long enough to get useful results. The ideal testing period will vary depending on how many variants you’re running. Here’s a useful chart to give you a rough idea of how long to run your tests, and how many conversions in that time period will give you an idea if your changes are working. Traffic also plays a big part, as low traffic sites will have to run tests for longer to get the minimum number of conversions needed. Here’s a tool from VWO to help you work out how long your test should run. Finally, you want to know if your test results are statistically significant. Or, to put it another way, do the results actually amount to anything that’s likely to affect your sales or other business metrics? A good way to check this is to input your visitor and conversion numbers for tests and variants into this handy tool. You’ll immediately get information on your conversion rate and the statistical significance of your results. One more word of caution for you. 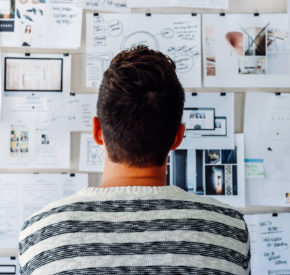 There are lots of conversion optimization case studies around, and by all means, use case studies and research to point you in the right direction. But beware of simply trying to replicate other people’s tests. Every website and business is different. A tactic that boosts sales conversions for Apple.com is not necessarily going to work for Bluth’s Original Frozen Banana Stand. You need to design your own tests with your own data about your own audience if you want your conversion optimization process to be successful. 12. Which pages should I test first? When you’re trying to improve conversions, it’s tempting to test everything, but that’s not a good idea. Instead, it’s a better use of time, effort, and budget to test pages or email campaigns that make a difference to revenue, either directly, or indirectly. People who are on these pages have already decided they probably want to buy (or, in the case of the thank you page, they did buy), so small tweaks here can directly result in more revenue. For eCommerce sites, the performance of the home page is also key. This is where many people start their product searches. So improving navigation, search and other functionality will help get people started on their purchase journey. On the email side, start by experimenting with campaigns that have the largest audience and drive the most revenue. That likely includes things like abandoned cart campaigns, win-back emails, and product announcements. 13. What elements should I test? With email, you can test similar items: content, images, call to action text. You can also test some things that are specific to email, such as personalization, subject line, sender name, send time, or audience segment. 14. How do I interpret my CRO test results? At the end of a test, you should be able to see whether you’ve experienced an increase in conversions. You’re not sure, in which case, you go back to the drawing board, and test again. Some of the most successful companies test constantly, tweaking until they achieve their ideal results. 15. What are some of the best conversion optimization tools? Still need more? Check out this list from Convert. Now you know the ins and outs of conversion optimization, you’re all set to create your own hypotheses and tests, and get more conversions. And if it seems intimidating, just start with one small tweak—then expand from there.